Happy weekend, PV fam! You better make sure to sit down to read this week’s beauty roundup because we’re bringing the best news ever! Read about the latest from ColourPop (it’s so bad, it’s good!) and the affordable glossy lip dupe you’ll want to grab from Ever Bilena. We’ve also got big scoop on Glossier and new candy nail polish to play with. Oh, and Rihanna is bringing back her Body Lava - just in time for summer! When it comes to epic collab launches, ColourPop Cosmetics is definitely one of the front runners. Following the success of their Disney Designer collab last year, the young and funky brand is now giving us the collection we’ve always wanted - the Disney Villains Collection. Glam up with Ursula, Maleficent, Hades, Dr. Facilier, and Cruella de Vil with these dramatic pops of color. They have eyeshadow palettes, highlighters, jelly shadows, lip glosses, lipsticks, and more! From the neon-inspired packaging to the summer-y color stories, this entire collection is wicked…ly good. 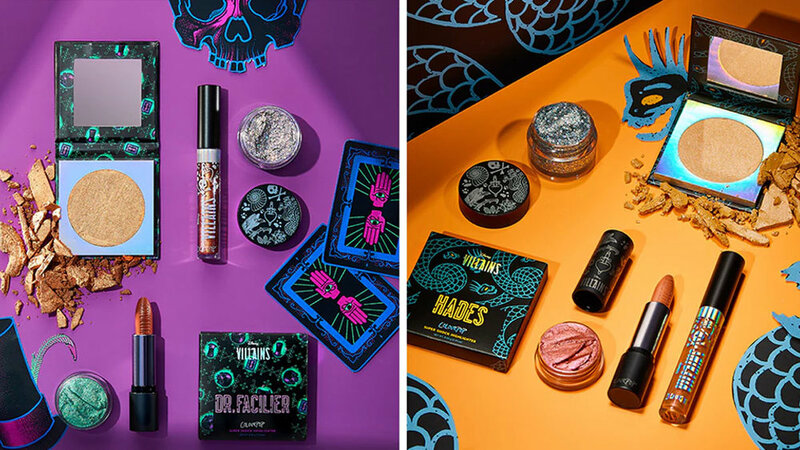 Shop the ColourPop x Disney Villains collection on the ColourPop site here. Now that bare is in and flip flops are the footwear of choice, bright colored nails are just the thing to get into the fun summer mood. The new Sally Hansen x Jelly Belly Insta-Dri Nail Colors ($4 each) offers 11 delicious shades that look exactly like their jelly bean counter parts! Choose from colors like Berry Blue (teal), Bubble Gum (purple), Very Cherry (red), Strawberry Cheesecake (complete with “specs” aka glitter), and Peach! The bottles are even stamped with the Jelly Belly logo and make painting nails much more fun! Have you always wanted to try a lip plumping gloss but didn’t want to break the bank? With tons of brands carrying “lip plumping” glosses, choosing one to merely “test out” can be quite a challenge. Well, maybe this will help you! New to the Ever Bilena x Kris Aquino Collection, the Kris Tinted Lip Gloss is a shiny color topper that promises give you fuller and plumper lips! The best part? It will only cost you P225, which isn’t bad if you ask me! Time to give mattes a break and embrace a dewy look this summer! Get ready, Kylie Jenner, there’s a new billionaire on the rise! Despite being a fairly young company, it has been confirmed that Glossier, headed by Emily Weiss, is now reportedly at a $1 billion valuation! Aside from that, the millennial pink pouched giant also received $100 million in funding from Sequoia Capital, a firm that has previously funded top brands like Charlotte Tilbury, Apple, and Paypal. With this new funding, we can only expect more product developments, reformulations, and new items for the company this coming year. We can’t wait to see what great things they’ll do next! Okay, I might have stretched the title a little bit, but I can’t help it: I am living for this news! Aside from FENTY Beauty restocking their famous Body Lavas, Rihanna and her team have also announced the drop of a new shade inspired by one of their best selling powder highlighters! Trophy Wife will now be available in Body Lava form - helping you get that amazingly golden hue with just a few pumps! The FENTY Beauty Body Lava in Trophy Wife (P3,650) will also come in a special gold packaging, making it look nothing short of luxe. Shop FENTY Beauty on Sephora Philippines. There’s nothing more inspiring than when a company takes a stand on an issue that truly matters. AVON Philippines has been advocating for the end of violence against women and girls, and this year, the cosmetics and retail giant renews their promise. Stand4Her is a global plan that aims to help 100 million women advance their earnings, push for their freedom of expression, and the right to live safe and healthy lives. AVON has also tapped celebrity Ruffa Gutierrez along with her daughters Lorin and Venice to help shed light on the different forms of abuse through their personal experiences. With this initiative, AVON hopes to help women (and men) realize just how important it is to never tolerate or accept abusive behavior. In line with this, AVON has released a limited edition “Free as a Butterfly” jewelry set (P299) to help fund partner NGOs that support women’s rights. With every set sold, P50 will go to an NGO to help aid more Filipinas around the country. You can shop the gorgeous jewelry set from any AVON representative or online here. Take a stand, spread the love, and lend a hand. Wouldn’t it be nice to spend hot summer days just lounging by the beach with a cold glass of your favorite drink? If you can’t get away from the city, Leaders brings the experience to wherever you are! They’ve just released their Juicy Pina Colada Bright Mask and Juicy Mojito Clearing Mask (P189 each) to keep your skin refreshed and hydrated, no matter how hot it gets! Both sheet masks feature fruit-infused essences to further channel that summery vibe while giving your skin the TLC it needs. Now available at Watsons, SM Beauty, BeautyMNL, and CNA.